Relations between Russia and Georgia have often been fraught since the collapse of the Soviet Union in 1991. The worst problems have usually been related to regional conflicts - the "frozen" conflicts in Georgia's breakaway regions of Abkhazia and South Ossetia, and the long-running guerrilla war in Chechnya. More generally, many Georgians accuse Russia of imperialism, while Russia criticises Georgia for nationalism and pursuing an anti-Russian foreign policy. Russia has been very critical of popular "revolutions" like Georgia's, which succeeded in 2003 thanks partly to Western-funded support for grassroots political activism. Whatever their differences, Russia is home to an ethnic Georgian community thought to number at least one million and many families back in Georgia, a nation of five million, depend on the remittances they send home. What triggered the latest escalation of tension? In March, the separatist authorities in Abkhazia and South Ossetia called on the UN and other international bodies to recognise their independence. No country has granted them recognition. But Russia argues that international recognition of an independent Kosovo challenges the UN's authority and risks aggravating tensions in the breakaway parts of Georgia. While many Western countries now recognise Kosovo, Russia backs Serbia's insistence that Kosovo remains part of Serbia. Russia said it would intensify social and economic co-operation with Abkhazia and South Ossetia, and recognise businesses and organisations registered there. Georgia said this amounted to "de facto annexation". Russia insisted Abkhaz rebels had shot down an unmanned Georgian spy plane - after Georgia said a Russian MiG-29 plane had shot down the drone over Abkhazia on 20 April. Are Georgia and Russia heading for war? Belligerent rhetoric has come from both sides and a local flare-up is always possible, but full-scale war seems unlikely. Georgia does not want to spoil its chances of joining Nato, and conflict would certainly undermine that bid. Nato members do not want to get sucked into a Caucasus conflict. Russia has key energy interests in the Caspian region and wants to avoid another costly round of fighting in Chechnya - so fighting in Georgia could impact on those ambitions too. But Russia has warned it will retaliate if Georgia uses force against its breakaway regions. It has accused Georgia of preparing to invade Abkhazia, and says it is boosting Russian forces there and in the South Ossetia region. Russia says Georgia is massing 1,500 soldiers and police in the upper Kodori Gorge, the only part of Abkhazia which remains under government control. Georgia denies such a build-up. Russia has about 2,000 peacekeeping troops in Abkhazia and about 1,000 in South Ossetia, in line with peace accords reached in the 1990s. How has the dispute affected economic ties? Relations reached a low in 2006, when Russia banned the import of Georgia's main products - wine, mineral water and mandarin oranges - on health grounds. That autumn, Georgia arrested four Russian military officers based in Tbilisi for spying and expelled them. Russia recalled its ambassador and subsequently deported at least 130 Georgians on the basis of their immigration status. In March 2008, a direct Georgia-Russia air service resumed, 18 months after it was suspended by Moscow amid the spying row. Russia had accused Georgia of owing debts for air traffic control services. Russia also resumed sea and postal links with Georgia. How far back do tensions go? They began even before the collapse of the Soviet Union, when Georgian nationalism started to become a potent political force. A key moment came in April 1989 when the Soviet military used force to crush a pro-independence protest, killing 19 people. From then on, Moscow - whether as the capital of the Soviet Union or of Russia - has been seen by many Georgians as an enemy of Georgian independence. Is it true that Russia has a record of trying to undermine Georgia's independence? 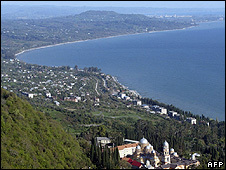 During the Abkhazia conflict, which began in 1992, the year after Georgia gained independence, there were numerous reliable reports of Russian forces assisting the Abkhaz separatists. However, this policy may have been made by military commanders on the ground, rather than in the Kremlin. 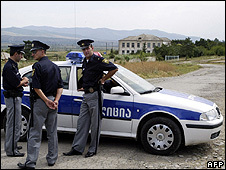 Many Georgians suspect that the Russian peacekeepers deployed in Abkhazia and South Ossetia are tools to preserve Russia's influence in the region. But if they seem threatening to Georgians, from the perspective of the Abkhaz and the South Ossetians, they are a crucial guarantee against possible Georgian aggression. Georgians blame at least two assassination attempts against former President Eduard Shevardnadze (1992-2003) on a former Georgian security chief, Igor Giorgadze. Mr Giorgadze fled to Russia in the mid-1990s and founded a pro-Russian Georgian political party in 2003. A number of party activists were arrested in September 2006 accused of plotting a coup to oust Georgian President Mikhail Saakashvili. Has Georgia tried to establish good relations with Russia? There were periods in the 1990s, under the leadership of Eduard Shevardnadze, when relations were relatively amicable. However, Georgia has always kept Russia at arm's length. By contrast it has made great efforts to court Nato, the US and other Western powers, including Turkey. It was one of the founders of the GUAM group of countries (Georgia, Ukraine, Azerbaijan, Moldova) established as part of attempts to counterbalance Russia's influence in the region. It has also enthusiastically taken part in Western-backed efforts to create an energy "corridor" across the Caucasus to the Caspian, bypassing Russian territory. Relations have been more than usually strained since the 2003 Rose Revolution, which brought Mr Saakashvili to power. What role has Georgia played in the conflict in Chechnya? Russia has sometimes accused Georgia of supporting the Chechen rebels, and certainly supplies and reinforcements have been known to reach the rebels via Georgian territory. Rebels have also been known to take refuge in the Pankisi Gorge, on the Georgian side of the border, where there is an ethnic Chechen community. Tensions peaked in 2002, with Russia threatening to mount cross-border attacks against the rebels. Georgia then took steps to establish order in the gorge, and agreed to joint patrols of the border.